I heard that we were getting a new yarn store earlier last year but got so bogged down with work that i totally forgot. So when i randomly found her store during a Google search ( must be FATE) i got so overwhelmed that i shopped online (www.pashminacaprice.com there 3 times in a single week & as if that was not enough to top it all i decided to go there on Friday so i could drink in the atmosphere Live & buy even more yarn ! As you can see from the photo, i was very excited. Very excited indeed with my armful of Phildar yarns. 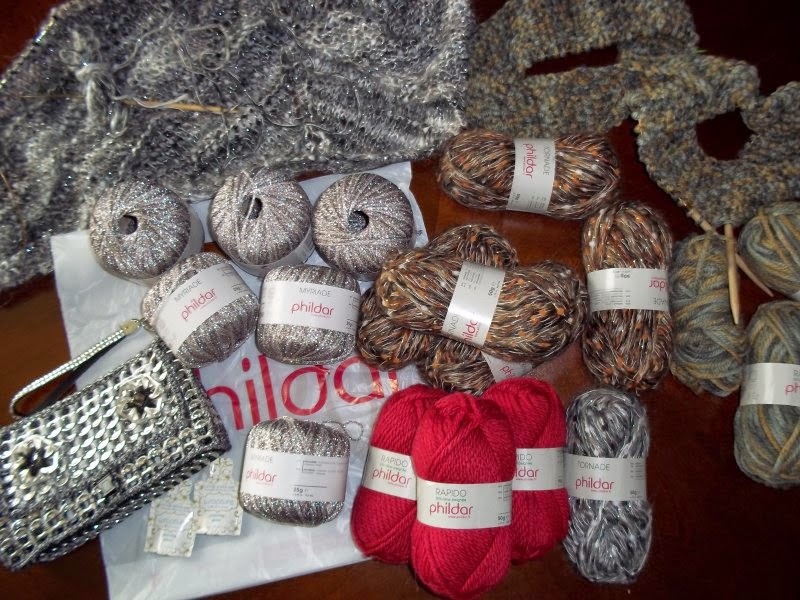 I suppose i got carried away because we did not have any GOOD yarn stores in our area until Pashmina Caprice came along & i have not been able to knit with Phildar for 20 +years & Natalie's Top Selling Brand is Phildar Looks like i found my knit heaven.....as my husband says 'OH NO' ! Your probably wondering why i buy yarn when i own a mill.....that's what he is thinking. He being my Hubby Gilbert, he smiles a lot but I'm sure he thinks I'm crackers ! 6 balls of Myriade in Meteore colour-$11.85 each . & lastly 4 balls of Tornade in Meteore colour-$7.50 for a shawl I'm knitting. Orders are shipped out same day ! That day i got a lot of Compliments for my Red Merino shawl. I forgot how pleasing the colour RED is to wear, somehow makes you feel happy or it may have been the 'yarn Fumes' ! I was looking for an idea for this months blog post so it had to be the Red Shawl. 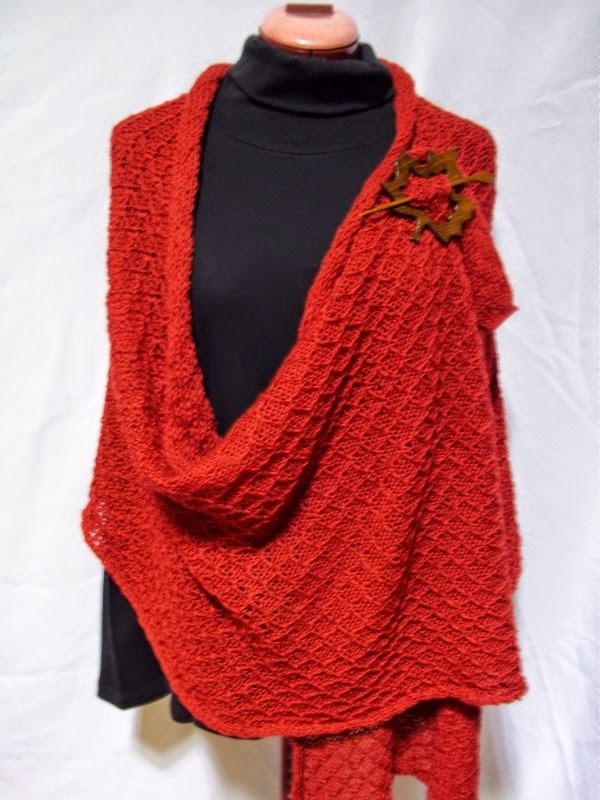 One winner will be drawn at random to win the Tomato red shawl ( a new shawl not used, knit from the same batch of yarn) The fibre content is: 90% Merino-10% silk. Has a lovely soft handle & drape to it. The yarn is a very lightweight 3 ply so its quite sturdy & not prone to clicks & pulls. Sorry no shawl pin you will have to provide your own. As you can see I'm not small, quite chubby,(my hubby says I'm Cuddly) The shawl is quite a generous size & should fit almost everyone ! To Enter: tell me the name & Location of your very favourite yarn store ! Have a Lovely Summer ! My favourite yarn store is the Kniterary located downtown Whitby. The owner is very helpful and besides having lots of wonderful yarn carries a variety of fibre for spinners as well. I drop in every now and then when the urge overcomes me even though I have plenty of stash at home. LOL, somehow I think she understands the need to see the new balls of yarn even though I don't always buy them. 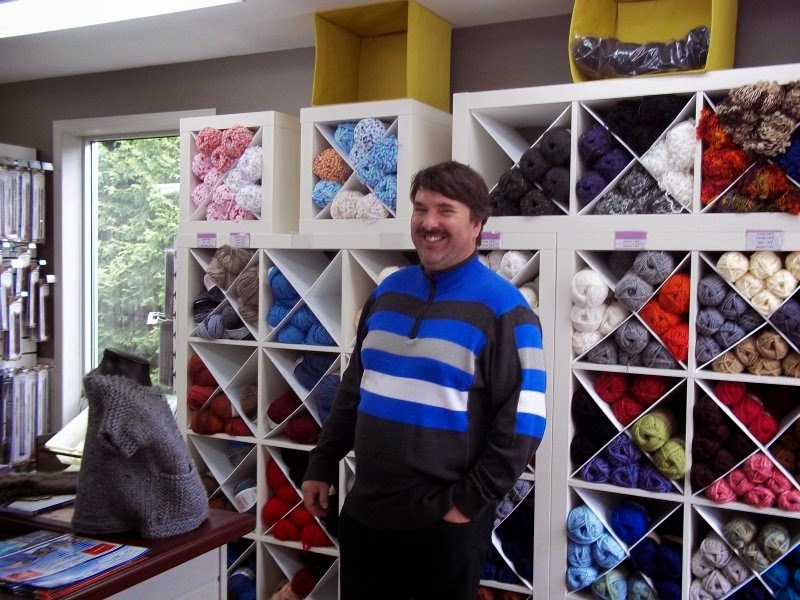 My favorite yarn store is the closest to me – The Knitting Basket in McMinnville, OR. Don't get there often, though; like you, I have my own supply and try to knit from stash. My favorite yarn store is Ply, Yarn, Art & Handwovens located in Wimberley, Tx. That's tricky since Shall we Knit in Waterloo is a great store, but my favourite is probably the Needle Emporium in Ancaster, ON. I don't have a favorite brick yarn store, because I live in a small town in Lithuania and there only two yarn stores here, but both stock mostly acrylic yarns and I love wool:) I get most of my yarns online, and my favorite online store is newlanarkshop.co.uk. I really don't have a favorite yarn store, the one that we had in the little town that I live in The Gateway Fibers just went out of business, so I will shop at the local Stedman's Store. I do shop for yarn/wool on line, I have tried a few and have had great experiences with them so I will continue to do this. I would love to win some yarn/wool from you I am dying to try it. How do I pick just one??? We have so many great places! I'd have to say my favorite is probably Romni Wools. There's just so much to choose from!!! I have 3 favorites, and all for different reasons: Tippecanoe Weaver and Fibers Too, in Tipp City, OH; Fiberworks in Beavercreek, OH; and The Rabbit Hutch in Englewood, OH. I tend to get to these more than any others, but all the LYSs in the area are great and have a variety of items to choose from. We're really quite fortunate to have as many stores as we have in our area. My favorite is "Knit This, Purl That" in Pleasanton, California. 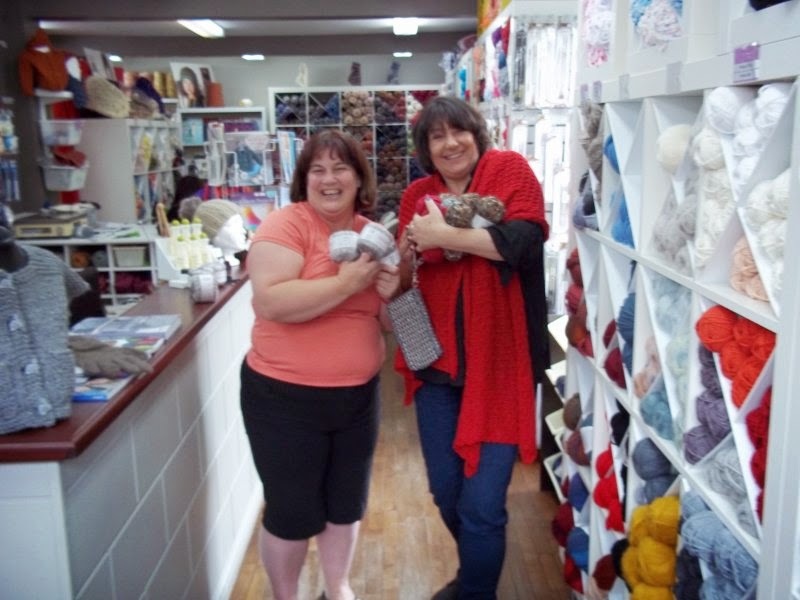 They have beautiful yarn and are willing to help knitters whenever needed. My favourite yarn store is the Purl Bee in Soho, New York City which is unfortunately a very long way from my home in Ontario. When I visit my sister-in-law we always make time to stop in at the "Little Wool Shop" in 100 Mile House, B.C. A small place that caters to everything needlework with some of most things and a proprietor who is soooo helpful. A wonderful way to spend an hour or so. There is no local yarn shop here. My favorite yarn came from Cottage Craft Angora Mill. It was an angora/qiviut blend. I knit fingerless gloves for a Christmas gift for a special person. The recipient wore them daily almost all day as they were so soft and warm. I got to play with beautiful yarn while making them. So it was a win/win! My favourite 'lys' is actually an online shop. Ripples Crafts has been selling hand-dyed yarn to me for years. The colours are amazing. I very rarely buy from anywhere else. I LOVE my LYS, Seaside Yarns, right here in Juneau, Alaska! Locally dyed yarns, locally made project bags, locally made ceramic buttons and yarn bowls, local handspun and knit stuff. And the owner is a dear friend too. Sent via Rav! THANK YOU! It's gorgeous and I look forward to wearing it! So hard to only pick one LYS. If I am going by strictly "local" I have to say Fiber Factory in Mesa AZ. Not only do they have good yarns, they also have lots of cool classes for weaving and other fiber arts. The area I live in does not have any particular awesome Yarn Shops. One weekend in May our state host a Sheep and Wool festival which features hundreds of yarn and wool shops from all over the U.S. You can buy any type of yarn. I always go to it to learn about new products as well as new types of yarn. So I would have to say shopping at the Maryland Sheep and Wool Festival is the my favorite yarn shop. If you are looking for the widest collection of latest design shawls online, then there is a good news for you. MyDreamSarees is now offering the customers of US and Canada different types of Online Designer Shawl, Kashmiri Shawls, Pashmina Shawl, Jamalwar Shawls, and Top Evening Shawl etc. It is guaranteed that you will get the Best Wool Shawl in our website. Here in the Niagara Peninsula, I'd have to say that The Fibre Garden, in Jordan, is my favourite!